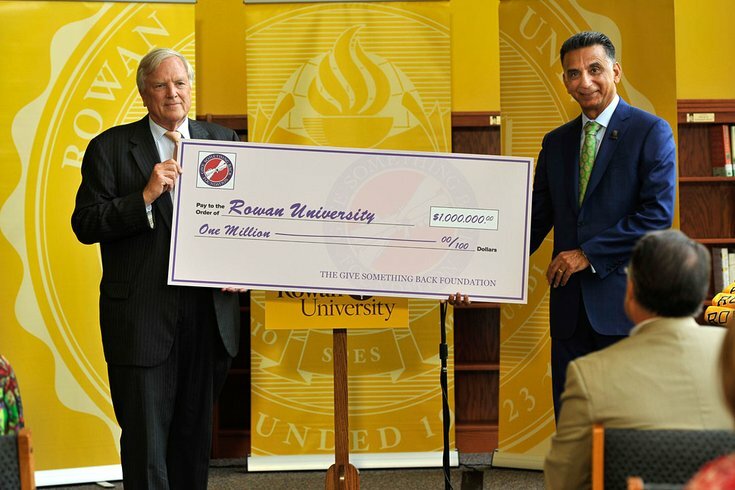 Robert Carr (left) presents a symbolic check for $1 million for scholarships to Rowan's president, Dr. Ali Houshmand. On the same day that students held a protest to demand tuition-free college, Rowan University announced a new plan to allow students to save a quarter of their tuition by graduating in three years. The plan would require students to live on campus at the Glassboro, New Jersey school for all three years – but classes and housing would both be free during the summer, saving students around $22,000 over the course of their college education. "We are not reducing the number of credits required to attain a bachelor’s degree, but rather we are providing highly motivated, academically prepared students a pathway to take that will reduce their time to complete a degree," provost James Newell said. Just as Rowan announced the new plan on Thursday, around 40 to 50 students held a rally in favor of tuition-free school, NJ.com reported. They were joined by students in Philly and across the nation as part of the "Million Student March," a movement to demand free education, forgiveness of student debts and a $15 minimum wage for campus workers. University president Ali Houshmand said that the new three-year degree option would make financial sense for some students, even though it means they can't take a summer job. "The program is exciting in that it enables our students to have a deeper, richer college experience while saving approximately 25 percent on the overall cost of attaining their bachelor’s degree," said Houshmand. The three-year degree program will include a leadership and entrepreneurship internship program and the chance for research or work opportunities with Rowan staff. Houshmand told the Philadelphia Business Journal that he only expects around 100 students in the upcoming fall freshman class to participate in the program, but he hopes that number can grow. If it does, it could be a boom for area businesses as Glassboro wouldn't turn into a ghost town in the summer. "Our Glassboro campus is woefully underutilized in the summer," he said. Rowan will announce which majors are available for the three-year program and explain how students can apply on Dec. 1.